Cerebral arteriovenous malformations (AVMs) are rare intracranial findings usually presenting with haemorrhage and annual risk of bleeding accounting for 2-4% [1,2]. Other clinical presentations of AVMs besides intracranial haemorrhage include seizures, headache, and focal neurological deficits [1,2]. The main goal of treatment of AVMs is to eliminate the risk of the most serious and common complication, which is intracranial haemorrhage, and to preserve the patient’s functional status [2-4]. Several treatment options for patients with AVMs include conservative treatment, neurosurgery, radiosurgery, or endovascular obliteration [1,5]. Between 2008 and 2014, 50 patients with medium age 38.20 years (σ = 13.56) were diagnosed with AVMs and were qualified for invasive treatment in our Centre (Table 1). The studied population consisted of 18 women (36%) and 32 men (64%). Two invasive methods of AVMs treatment were used in our Centre: neurosurgical procedure and endovascular embolisation. A total of 111 procedures were performed, including 17 neurosurgical (mean age: 34.88 years, σ = 11.02) and 94 endovascular (mean age: 38.56 years, σ = 13.86) procedures. If the patients had not been qualified to invasive treatment in our Centre, conservative treatment was implemented or the patient was referred to radiosurgery in other centres. The diagnostic scheme consisted of qualification based on the patient’s clinical presentation and DSA imaging. The choice of the preferred strategy was made by an interdisciplinary team composed of neurosurgeons and inter­ventional neuroradiologists. Medical records were reviewed for all patients. Presence of haemorrhage, Glasgow Coma Scale  (GCS) score, neurological symptoms, and co-morbidities on admission to hospital were assessed. In a group of 37 patients with intracranial bleeding 35 presented with intracerebral haemor­rhage and two with subarachnoid haemorrhage (SAH). Due to the small amount of SAH no differentiation into types of haemorrhage in further analysis was performed. Each patient underwent 3D digital subtraction angio­graphy (DSA). Other imaging data were not mandatory but assessed if available. 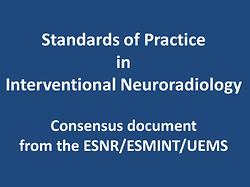 Assessed parameters of AVMs involved: location (side and lobes), superficial or deep localisation, localisation of the AVM in eloquent or non-eloquent areas of the brain, feeding arteries (amount and type), venous drainage, size of nidus, and presence of an AVM-associated aneurysm. Superficial AVM was defined as pail with the stipulation that no part of the nidus can be localised deeper than 1 cm. Superficial venous drainage was defined as drainage to superior sagittal sinus or transverse sinus. Any other drainage, including sigmoid sinus, was considered as deep venous drainage. The gathered data allowed us to classify all AVMs in Spetzler-Martin  and Spetzler-Ponce  scales. The amount of endovascular embolisation and neurosurgical procedures was analysed. It was taken into consideration if the procedure was a first-choice treatment or followed any other invasive treatment. The effectiveness of treatment, ICU, neurosurgery ward stay after the procedure, and presence of early complications were also assessed. The Glasgow Outcome Scale  (GOS) was used to evaluate patients’ clinical condition on discharge. Influence of Spetzler-Martin and Spetzler-Ponce scales on GCS scores was calculated using ANOVA Kruskal-Wallis test. In other cases nonparametric tests, like Mann-Whitney U test, were used due to small samples in subgroups. All statistical analysis was performed by StatSoft Statistica v12.5. Nineteen and 42 AVMs were evaluated in Spetzler-Martin scale as grades 1 and 2, respectively. Because Spetzler-Ponce scale class A includes grades 1 and 2 of the Spetzler-Martin scale, 61 AVMs (55%) were qualified to this group. Forty-seven AVMs (42%) were evaluated as grade 3 and subsequently class B. With only three AVMs in grade 4 and none in grade 5, class C consists of only three AVMs (Figure 1). Seventeen neurosurgical procedures were performed. In nine cases, it was the first-choice treatment. The remaining ones were preceded by endovascular embolisation. Only one patient underwent two surgical procedures. Fifteen of 17 (88.24%) neurosurgical procedures had resulted in complete removal of the AVM. In both cases of unsuccessful procedures not all feeding arteries were clipped. Ninety-four endovascular embolisations were performed. No patients were qualified for this procedure after surgical treatment. Fourteen procedures (14.89%) led to complete embolisation of the whole AVM in the first attempt. Sixty-five procedures (69.15%) led to complete embolisation of one feeding vessel, fulfilling the aim of the procedure, as a part of multistage treatment. Fifteen procedures (15.96%) were unsuccessful due to complex anatomy of feeding vessels (11 cases), extravasation of contrast (three cases), and intraoperative haemorrhage (one case). Patients who underwent endovascular embolisation had higher early complication ratio (21.28%) than patients after neurosurgical operation (17.65%). Acute cardiopulmonary failure, cerebral haemorrhage, and CSF subcutaneous collection occurred in three cases after surgical procedure. Early complications after embolisation occurred in 20 cases (Table 2). In several cases more than one complication appeared. In majority complications were minor or transient which led to similar clinical condition of patients in both groups on discharge – according to GOS (mean GOS: 5.00 in operation and 4.89 in the embolisation group). Patients were hospitalised for approximately the same amount of time on ICU after neurosurgical (mean stay: 0.35 days) and endovascular (mean stay: 0.49 days) procedure. However, undergoing neurosurgical procedure had impact on longer hospitalisation on the neurosurgery ward (10.59 days vs. 6.32 days, p < 0.01). Patients who were evaluated as Spetzler-Martin scale grade 1 were more frequently qualified to neurosurgical procedure than patients in higher grades (Figure 2). Cerebral haemorrhage was also observed more frequently as grade 1 (47.37% grade 1; 28.57% grade 2; 31.91% grade 3). Higher Spetzler-Ponce scale scores (p = 0.02), eloquent localisation (p = 0.04), and deep cerebral localisation (p = 0.01) of the AVM were associated with lower GCS scores. Eloquent localisation of the AVM was also associated with longer hospitalisation on the neurosurgery ward (p = 0.02). Spetzler-Martin scale, Spetzler-Ponce scale, eloquent localisation, and deep cerebral localisation had no influence on the effectiveness of the therapy, early complication rate, GOS score, and hospitalisation time on ICU. The incidence of neurological deficits and deaths caused by AVM treatment ranges from 0 to 20% (mean 8%) . Optimal therapeutic strategy should be characterised by decreasing haemorrhage risk and alleviating neurological symptoms with an acceptable mortality and morbidity rate . Complete obliteration of AVM is the main goal of the treatment because subtotal therapy does not confer protection from haemorrhage . Nowadays four different types of therapeutic approach are considered: microsurgical resection, endovascular embolisation, stereotactic radiosurgery, and conservative management. These modalities could be applied alone or in combination [12,13]. Choosing the best therapeutic strategy could be difficult; however, making a decision whether the preventive eradication of unruptured lesions is required seems to be the most significant dilemma connected with AVM treatment [14-16]. Results of the randomised clinical trial ARUBA show that the risk of stroke and death after the initiation of unruptured AVM invasive treatment is more than threefold higher than in patients treated conservatively ; however, the study has important limitations, and its significance is discussed by some authors . Due to literature controversies according to clinical outcomes of invasive treatment of AVMs, we decided to present the data from our Centre. Additionally, we undertook the assessment of the impact of Spetzler-Martin and Spetzler-Ponce scales on qualification to endovascular embolisation or neurosurgical procedure. The role of endovascular embolisation in AVM treatment remains controversial. It appears to be useful in large or deeply located lesions, but at the same time some authors highlight significantly higher risk of complications occurring during this procedure and worse outcomes in patients who have undergone preoperative embolisation [12,19]. On the other hand, according to the analysis of 33,997 patients diagnosed with AVM between 2001 and 2009 conducted by Davies et al., the proportion of AVMs treated endovascularly is increasing . In our study embolisation was the preferred treatment strategy in the majority of cases. Our data suggest that risk of morbidity is higher for embolisation than for surgical intervention. At the same time patients treated surgically tend to stay in hospital longer, which was also proven by other authors . The Spetzler-Martin grading system was designed to predict the outcome of surgical treatment [7,21]. Our study confirms its usefulness in treatment planning; however, Spetzler-Martin and Spetzler-Ponce scores do not impact the effectiveness of therapy. Recommended management for AVMs in grade I and II is microsurgical removal, while IV and V grade lesions should be treated conservatively . Surprisingly, in the analysed group a higher percentage of AVMs treated surgically was observed in grade III than in grade II. On that basis, it could be concluded that neurosurgeons take the Spetzler-Martin grading system into consideration too rarely. It should be mentioned that Spetzler-Martin criteria do not include morphologic features like the number of feeding arteries or the presence of associated aneurysms (which have an impact on haemorrhage risk), and there are no reliable data correlating these factors and treatment outcome . The Spetzler-Martin system does not reflect the major determinants of risk associated with embolisation . For this reason, other grading systems for endovascular therapy, assessing higher numbers of various data, should be used during qualification to invasive treatment (for example, Buffalo score, proposed by Travis et al. in 2014) . According to our results, there is no correlation between deep or eloquent brain location and treatment outcome or early complications rate. It should be emphasised that the definition of “brain eloquence” is not clear enough – there are differences in its interpretation, which result in variable coding  and make comparing data obtained from different units difficult. The univariate analysis performed by Hartman et al. revealed that more frequent embolisations, no neurological deficit at baseline, non-haemorrhagic AVM presentation, large AVM diameter, Spetzler-Martin score, deep venous drainage, and eloquent AVM location were associated with long-term treatment-related neurological deficits . Our study, as a retrospective survey, is associated with the necessity of being based on previously collected data only. Therefore, some patients must have been excluded from the study due to lack of data. Including those patients, if the data were complete, may have had an influence on the final results of this study. Moreover, we were not able to evaluate long-term complications of treatment, which is an important limitation. It was not possible to assess the risk of haemorrhage after embolisation and surgical intervention in our patients’ due to lack of long-term follow-up. What is more, we analysed only two therapeutic strategies, because radiosurgery is not available in our Unit. Due to lack of sufficient and conclusive data concerning the necessity of invasive treatment and subsequent qualification to one of the treatment methods, further studies in this area should be performed. Treating AVMs requires coordination of a multidisciplinary team. Both endovascular embolisation and neurosurgical procedure should be considered as part of multimodal, frequently multistage treatment. Spetzler-Martin and Spetzler-Ponce scales have an influence on haemorrhage frequency and patients’ clinical condition and should be taken into consideration in selecting the treatment method. This research project received no specific grant from any funding agency in the public, commercial, or not-for-profit sectors. 1. Greenberg MS. Handbook of Neurosurgery. Thieme, New York 2006; 835-839. 2. Ajiboye N, Chalouhi N, Starke MR, et al. Cerebral arteriovenous malformations: evaluation and management. Sci World J 2014; 649036. 3. Abecassis IJ, Xu DS, Batjer HH, Bendok BR. Natural history of brain arteriovenous malformations: a systematic review. Neurosurg Focus 2014; 37: E7. 4. Gross BA, Scott RM, Smith ER. Management of brain arteriovenous malformations. Lancet 2014; 383: 1635. 5. Ogilvy CS, Stieg PE, Awad I, et al. Recommendations for the Management of Intracranial Arteriovenous Malformations. A Statement for Healthcare Professionals From a Special Writing Group of the Stroke Council, American Stroke Association. Stroke 2001; 32: 1458-1471. 6. Teasdale G, Jennett B. Assessment of coma and impaired consciousness. A practical scale. Lancet 1974; 2: 81-84. 7. Spetzler RF, Martin NA. A proposed grading system for arteriovenous malformations. J Neurosurg 1986; 65: 476-483. 8. Spetzler RF, Ponce FA. A 3-tier classification of cerebral arteriovenous malformations. J Neurosurg 2011; 114: 842-849. 9. Jennett B, Bond M. Assessment of outcome after severe brain damage. Lancet 1975; 1: 480-484. 10. Hartmann A, Mast H, Mohr JP, et al. Determinants of Staged Endo­vascular and Surgical Treatment Outcome of Brain Arteriovenous Malformations. Stroke 2005; 36: 2431-2435. 11. Mohr JP, Parides MK, Stapf C, et al. Medical management with or without interventional therapy for unruptured brain arteriovenous malformations (ARUBA): a multicentre, non-blinded, randomised trial. Lancet 2014; 383: 614-621. 12. Al-Shahi R, Stapf C. The prognosis and treatment of arteriovenous malformations of the brain. Pract Neurol 2005; 5: 194-205. 13. Potts MB, Lau D, Abla AA, et al. Current surgical results with low-grade brain arteriovenous malformations. J Neurosurg 2015; 122: 912-920. 14. Stapf C, Mohr JP, Choi JH, et al. Invasive treatment of unruptured brain arteriovenous malformations is experimental therapy. Curr Opin Neurol 2006; 19: 63-68. 15. Ellis JA, Lavine SD. Role of Embolization for Cerebral Arteriovenous Malformations. Methodist Debakey Cardiovasc J 2014; 10: 234-239. 16. Pierot L, Cognard C, Herbreteau D, et al. Endovascular treatment of brain arteriovenous malformations using a liquid embolic agent: results of a prospective, multicentre study (BRAVO). Eur Radiol 2013; 23: 2838-2845. 17. Davis SM, Donnan GA. Unruptured brain arteriovenous malformations: another asymptomatic conundrum. Stroke 2007; 38: 3312. 18. Thapa A, Chandra S, Sinha S, et al. Surgical interventions in intracranial arteriovenous malformations: Indications and outcome analysis in a changing scenario. Neurol India 2009; 57: 749-755. 19. Morgan MK, Zurin AA, Harrington T, Little N. Changing role for preoperative embolisation in the management of arteriovenous malformations of the brain. J Clin Neurosci 2000; 7: 527-530. 20. Davies JM, Yanamadala V, Lawton MT. Comparative effectiveness of treatments for cerebral arteriovenous malformations: trends in nationwide outcomes from 2000 to 2009. Neurosurg Focus 2012; 33: E11. 21. Hamilton MG, Spetzler RF. The prospective application of a grading system for arteriovenous malformations. Neurosurgery 1994; 34: 2-6. 22. Hofmeister C, Stapf C, Hartmann A, et al. Demographic, morphological and clinical characteristics of 1289 patients with brain arteriovenous malformation. Stroke 2000; 31: 1307-1310. 23. Elhammady MS, Heros RC. Surgical management of unruptured cerebral arteriovenous malformations. J Neurosurg 2014; 121: 875-877. 24. Feliciano CE, de Leon-Berra R, Hernandez-Gaitan MS, Rodriguez-Mercado R. A proposal for a new arteriovenous malformation grading scale for neuroendovascular procedures and literature review. P R Health Sci J 2010; 29: 117-120. 25. Dumont T, Kan P, Snyder KV, et al. A proposed grading system for endovascular treatment of cerebral arteriovenous malformations: Buffalo score. Surg Neurol Int 2015; 6: 3.